Need an appetizer with a kick but that everyone can eat? This Ponzu Wasabi Spread is as delicious to eat as it is easy to put together. 4 ingredients are all you need to get the party started! Looking for an amazingly easy AND delicious appetizer? How about a simple starter that you already have all the ingredients for and takes less than 5 minutes to assemble? You’re all in, right?!? I am for sure. My time is precious and trying to put together some snacks last minute just stresses me out and makes every other aspect of my day/night even more stressful. Which makes me a not-so-joyous person to want to socialize with. 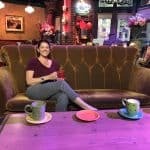 So apart from the normal party foods, and the quickie veggie trays you can grab at the grocery store, wouldn’t you like to see something different? Something unique. Something that you know isn’t already on the table. Maybe it’s because I am thinking about party foods non-stop and other people are not thinking about food all day long, but I love seeing all the different dishes at parties. I love getting new ideas, and hopefully new recipes, that keep entertaining fun and exciting. When I want to add a little zip and zing to a gathering I love spice. What usually has some spice? Asian foods! All that wasabi and sriracha get my mouth drooling at the mere mention of the words. Think making Asian food is hard? It doesn’t have to be!! 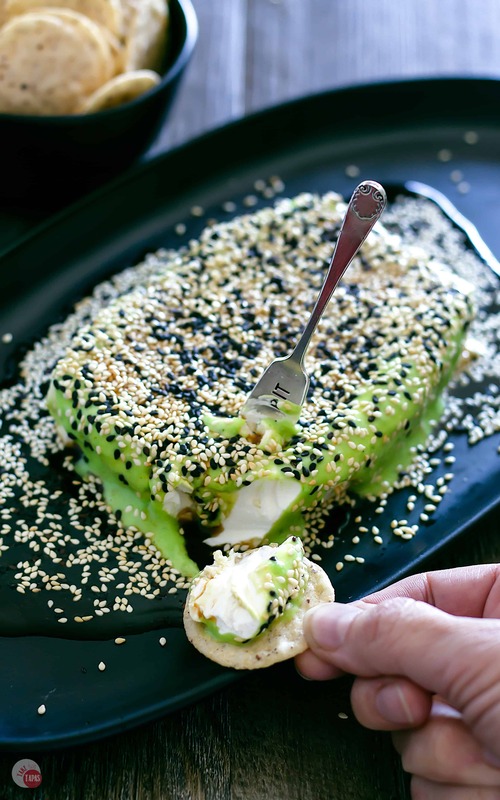 Just take me to the Easy Asian Cream Cheese Appetizer Recipe Already! If you’d rather skip my (very helpful, I think) tips and tricks, essential cooking info, and similar recipe ideas – and get straight to this delicious easy Ponzu Wasabi Spread recipe – simply scroll to the bottom of the page where you can find the printable recipe card. Just because I said Asian food, your mind doesn’t have to go to sushi right off the bat. Not that sushi isn’t a wonderful way to get the party started, plus you can get it already made fresh, and not get your hands dirty. But Asian food isn’t all sushi. You can have seared tuna steaks, pickled cucumber salads, spring rolls, and Chinese Chicken Salad Cups. These are fun and delicious party foods, but they do require a little assembly time, cooking, or other types of preparation that takes longer than 5 minutes. Plus you might not have all the ingredients on hand if someone drops by unexpected and you need something last minute. Who has time to run to the store while your guests are hanging out in the living room? The Wasabi Ponzu Spread is just the appetizer you are looking for! Q: Can I use soy if I don’t have Ponzu? A: Yes you can! I just prefer Ponzu for the citrus flavor so if you have soy I would add a little lemon or lime juice to it. Q: Can I make my own Ponzu sauce? A: Real Ponzu has 6 ingredients but in a pinch, I combine equal parts soy, citrus juice, and rice wine vinegar. If you need it a little sweeter, add a dash of sugar. 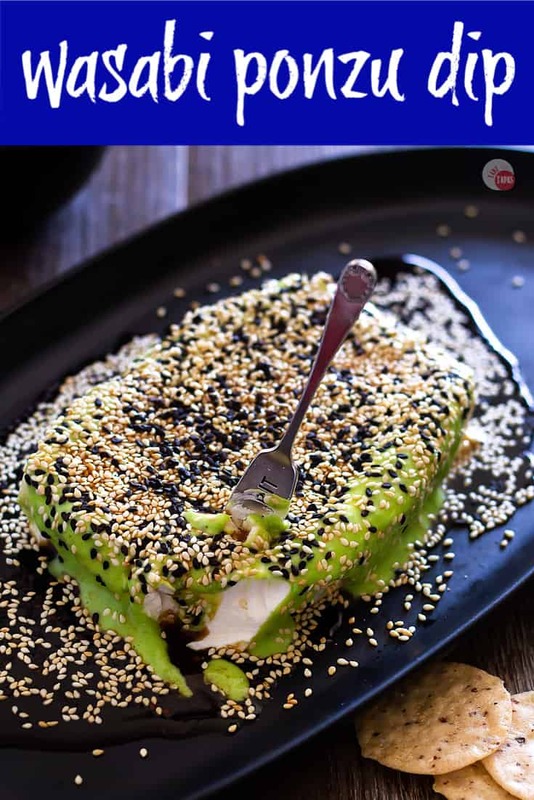 A: I would not recommend it as the ponzu and wasabi tends to break down the cream cheese and the sesame seeds get soggy. I would recommend having everything ready to and quickly assembling beforehand. Q: Is it super spicy, because I hear wasabi is spicy? A: If you use fresh wasabi it can be but I use a “wasabi sauce” which comes already prepared and mixed with oil, sugar, and mustard. It is a very mellow version of fresh wasabi so don’t worry! Wasabi Sauce for the WIN! This Wasabi Ponzu Spread is easy to put together because I always have the items on hand. My fridge is never without a block of cream cheese, soy sauce, wasabi sauce, or sesame seeds. Ever since having ponzu sauce for the first time, I prefer it to regular soy because of the added citrus flavors. If you only have soy sauce feel free to use that instead. No need to go out and get something different. The wasabi sauce is something else you might not have on hand, but I urge you to add it to your grocery list. It is not super spicy and lasts a long time in your fridge. It’s one of those condiments I always have on hand like mustard, horseradish, and maraschino cherries. 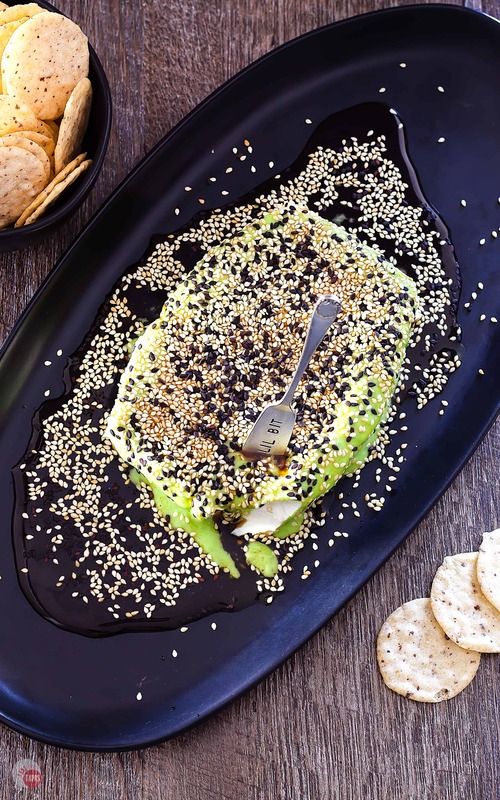 When you are ready to assemble the Wasabi Ponzu Spread, just place the cream cheese on a platter and press down a little to thin it out. Add your wasabi sauce, ponzu, and some toasted sesame seeds for garnish and crunch. 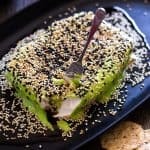 I always keep sesame seeds in my freezer because I buy mine in bulk but you can buy some already toasted in the spice section of your grocery store. Throw some rice crackers on the platter and you are ready to go! Other great Easy Asian Appetizer recipes to try! Looking for a quick appetizer you can make ahead of time for a get-together that you are hosting and are already stressed to the max? Check out all my cream cheese appetizers, both sweet and savory, to fit your special occasion! 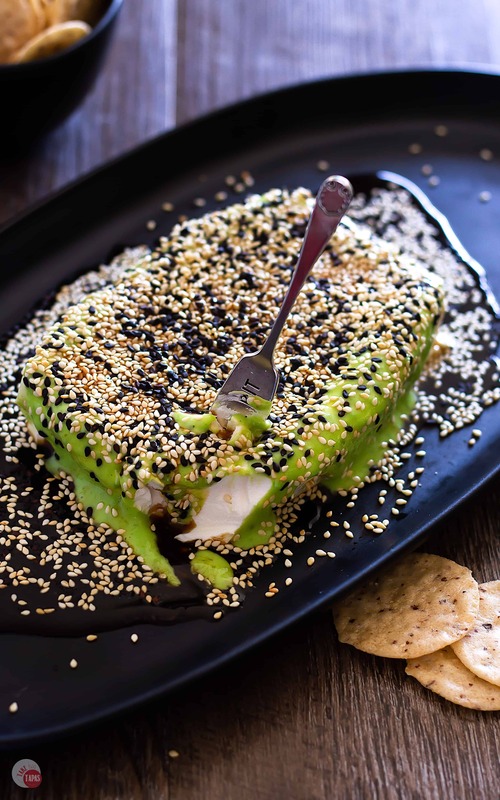 If you love this Easy Asian Cream Cheese Appetizer – Ponzu Wasabi Spread Recipe as much as I do, please write a five-star review in the comment section below (or on Pinterest with the “tried it” button – you can now add pictures into reviews, too! ), and be sure to help me share on facebook! Place block of cream cheese on serving platter. 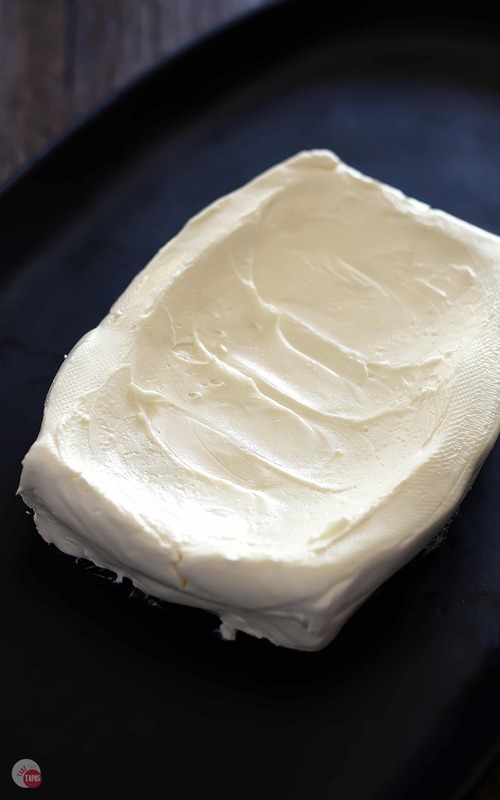 Using a spoon, make a well down the center of the cream cheese block. 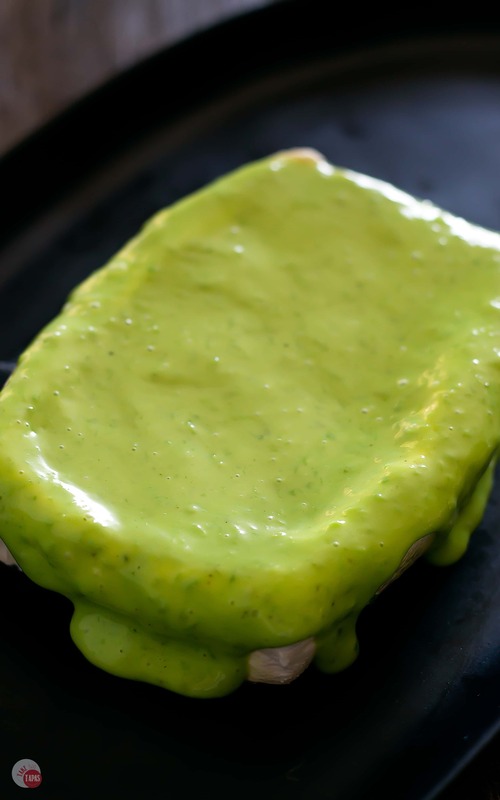 Pour wasabi sauce into the well and use a spoon to spread it to the edges so it flows a little over the sides. Drizzle Ponzu sauce over the top and around the cream cheese block. Sprinkle with sesame seeds for garnish. You can garnish with thinly sliced green onions if you have some on hand. Serve with rice crackers or other thin crackers. My goodness, you never cease to amaze me with your incredible appetizers, you are definitely my go-to party food blog. Thanks for another amazing recipe! I’ve never tried a ponzu appetizer, so this is going to be a treat! 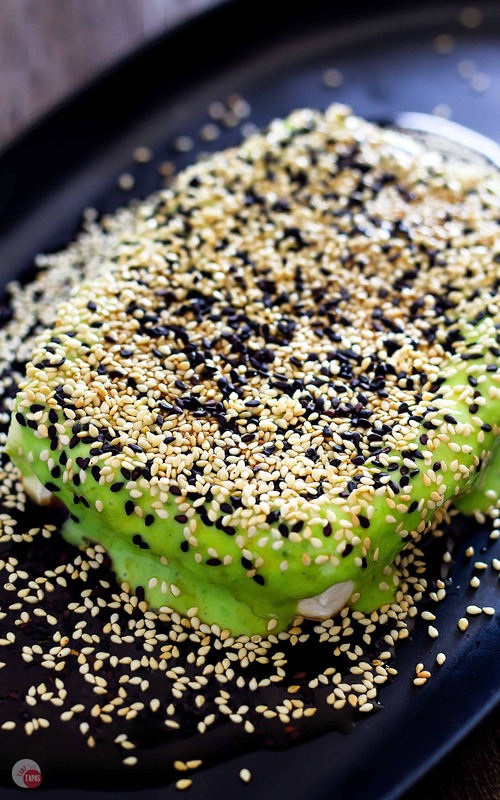 Such a pretty dish with the green wasabi sauce and the black sesame seeds. Bonus that no cooking is needed to put this together. The combination of wasabi and cream cheese sounds so good right now. Its almost midnight here, but, I still want to run into my kitchen and make it right now. Great recipe, Jennifer. This is a must try for me for sure!!!!! This is one of my favorite appetizers ever! Thanks for giving me new material for my super bowl party this year! This is gorgeous! Almost too pretty to eat! 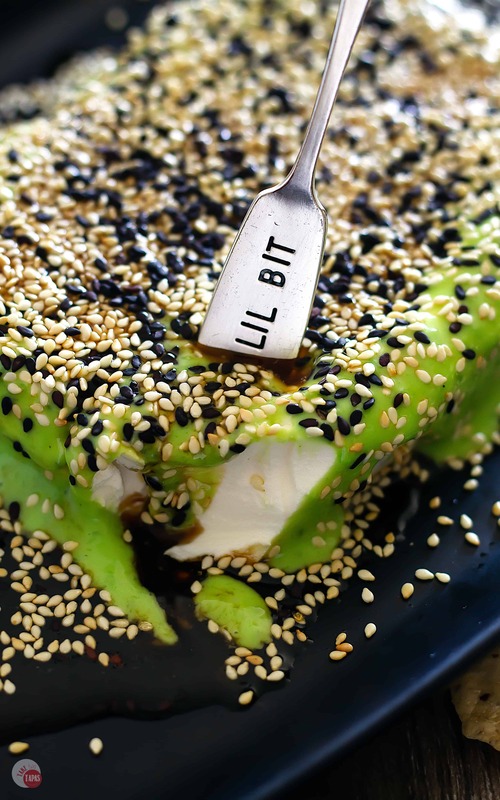 I love the wasabi sauce with the cream cheese…. a perfect mix of zing and cream in the same bite!! I’d give you 10 stars if I could! What a beautiful appetizer and so unique too. I’m entertaining this weekend and can’t wait to set it out and take in the accolades. Thank you for such a genius recipe! My mouth literally watered when I saw this photo!! I couldn’t get over here fast enough to grab the ingredients to make it! YUM!! SO MUCH YUM!